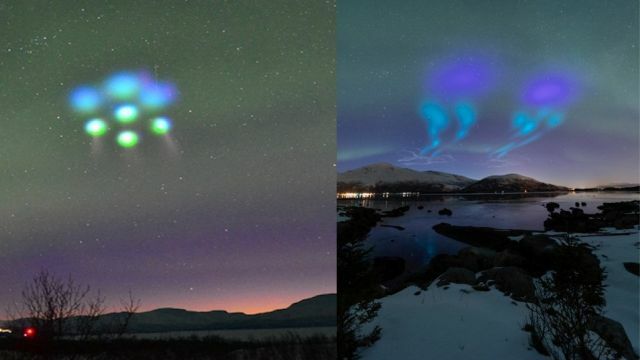 On April 5, 2019 in Norway, researchers at the Andøya Space Center launched two sounding rockets into a minor geomagnetic storm. The results were out of this world. Aurora tour guide Kim Hartviksen photographed glowing blobs of blue and purple caused by the rockets dumping chemical powders into the storm. “Residents for hundreds of miles were taken by surprise by these strange lights, which prompted calls to the police and ‘The aliens are coming!’ hysteria!” says Chris Nation who runs the Aurora Addicts guiding service. According to spaceweather, the name of the sounding rocket mission is AZURE–short for Auroral Zone Upwelling Rocket Experiment. Its goal is to measure winds and currents in the ionosphere, a electrically-charged layer of the Earth’s atmosphere where auroras appear. Specifically, the researchers are interested in discovering how auroral energy might percolate down toward Earth to influence the lower atmosphere. According to NASA, which funded the mission, the chemicals pose no hazard to residents in the region but since NASA is involved in this project, we always have to ask ourselves if it was really an Auroral Zone Upwelling Rocket Experiment or that the experiment was meant to test something else.